America is a big country - that's stating the obvious. The states may be united, but that doesn't mean that holidays are celebrated the same way everywhere. 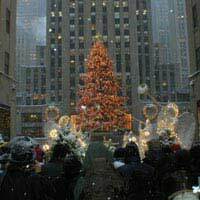 The innumerable Christmas traditions are prime examples of the many differences that exist on the North American continent. Take for example Hawaii, where the start of the Christmas period is marked by an elaborately staged event: Santa Claus sailing in on the Christmas Tree Ship. Quite different from California, where Father Christmas arrives riding the waves on a surfboard. Or New Orleans, for that matter, where a gigantic live ox decorated with ribbons is taken for a festive walk around town - an event joyously scored by New Orleans' many brass bands. Processions are held at other places, too: the Mummers Parade in Philadelphia, for example, lasts an entire day and consists of dressed-up people dancing all around town to the music of marching bands. The Las Posadas procession in Arizona is more religiously inspired: it stems from a Mexican tradition and depicts Joseph and Mary's search for a place to give birth to baby Jesus. Of course there are many similarities to be noted in Christmas traditions across the United States as well. As in nearly all countries that celebrate Christmas, the holiday has become closely associated with gift giving. Christmas is one of the most profitable times of the year for retailers, and they spend lots of time and money decorating their stores and windows. Many large department stores create elaborate christmas decorations and lighting. Many department stores also feature an "in-house Santa", who sits on a guilded throne surrounded by elves 'Santa's little helpers'. Kids can line up to sit on Santa's lap, ask him what they want for Christmas and have their picture taken with the jolly man - not an entirely painless process though, as scared toddlers often throw crying fits and other, less frightened children tug on Santa's beard. Another shared tradition is the Christmas Eve meal: no matter if it's hot and sunny outside or if the trees are covered in a thick layer of snow: Americans have turkeya for Christmas. The bird comes roasted, and is served with lots of different sauces and potato dishes. As in England, the traditional dessert is a Christmas pudding doused in brandy. Mince pies have become very popular, too. Traditionally, the meal is followed by the midnight mass. Remember how we mentioned Santa Claus arriving on a boat before? This is a direct reflection of the roots of the Santa Claus tradition. When the Dutch colonists first settled in America, they brought with them the Sint-Niklaas - or Sinterklaas - tradition. Sinterklaas was a saint who gave away his whole fortune to the young and needy, and every year in his memory quite a few continental European countries celebrate Sinterklaas on the 6th of December. Linguistically "Santa Claus" is an English version of "Sinterklaas', and Santa's costume mirrors that of the holy man too: Sinterklaas also had a penchant for red clothes and sported a long white beard. hey guys professor paul.. is back in the building!